Short story available as an eBook only (contact author about limited-edition signed paperbacks). eBook available exclusively at Amazon. **FREE** if you’re a Kindle Unlimited subscriber! The first story in The Balderdash Saga Shorts! Ideal for kids as young as 6 and as old as 11, depending on reading level and parental involvement. Be sure to check out the rest of The Balderdash Saga Shorts and the three novels pictured and linked at the bottom of the page. This is the first of the short stories featuring characters from The Balderdash Saga, each of which spotlights one of the beloved characters from the series. A pirate’s code is a fickle thing, and honor is relative in this short story that follows Roland the Pirate Knight. 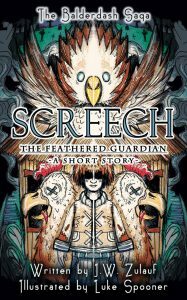 Screech the Feathered Guardian: The fourth of The Balderdash Saga Shorts is only available in this Special Edition! You can get the digital edition for free if you sign up for our mailing list. On one of his excursions, Kaylan is startled to hear a woman’s scream. After locating the source, he watches from the shadows as two men chase her down, swords drawn. Kaylan realizes with horror that humans stand merely an hour’s walk from Balderdash. He faces a critical decision. Should he run away to warn the rest of the underground kingdom about the human invaders in the caverns, or risk losing his life—and compromising the location of Balderdash—to save the woman?